Michael Levy - Composer for Lyre | Ancient Music - Recreated! | Blogs : New Archaeological Discoveries - in my Lounge, on my Laptop! 1. THE MYSTERY OF THE THE RIDGE DEPICTED RUNNING DOWN THE BACK OF THE ANCIENT BIBLICAL KINNOR - SOLVED! "the back of the kithara soundbox bulges out at the top, tapering toward the base; and in examples from the fifth century and later, it rises to a vertical ridge running down the centre of the back"
"...his left hand, fingers apart, sets the strings going, while the right hand moves the plectrum toward the kithara as if ready to strike it when the voice has paused in its song." This ancient text suggests that suggests that the melody was plucked with the fingers of the left hand, doubling the vocal line, and then the strums with the plectrum in the right hand, were used to fill the spaces between the vocal line, as bridges or as rhythmic beats. Orpheus sits there, the down of a first beard spreading over his cheeks, a tiara bright with gold standing erect upon his head, his eye tender, yet alert, and divinely inspired as his mind ever reaches out to divine themes. Perhaps even now he is singing a song; indeed his eyebrow seems to indicate the sense of what he sings, his garment changes colour with his various motions, his left foot resting on the ground supports the lyre which rests upon his thigh, his right foot marks the time by beating the ground with its sandal, and, of the hands, the right one is firmly grasping the plectrum gives close heed to the notes, the elbow extended and the wrist bent inward, while the left with straight fingers strikes the strings"
Here is yet another ancient literally gem, this time by Philostratus the Elder - this passage describes how the left hand fingers are playing at the same time as the plectrum in the right hand - yet more evidence of the use of harmony in antiquity? The clever device of the lyre, it is said, was invented by Hermes, who constructed it of two horns and a crossbar and a tortoise-shell; and he presented it first to Apollo and the Muses, then to Amphion of Thebes.32 And Amphion, inasmuch as the Thebes of his day was not yet a walled city, has directed his music to the stones, and the stones run together when they hear him. This is the subject of the painting. Look carefully at the lyre first, to see if it is painted faithfully. The horn is the horn “of a leaping goat,” 33 as the poets say, and it is used by the musician for his lyre and by the bowman for his bow. The horns, you observe, are black and jagged and formidable for attack. All the wood required for the lyre is of boxwood, firm and free from knots – there is no ivory anywhere about the lyre, for men did not yet know wither the elephant or the use they were to make of its tusks. The tortoise-shell is black, but its portrayal is accurate and true to nature in that the surface is covered with irregular circles which touch each other and have yellow eyes; and the lower ends of the strings below the bridge lie close to the shell and are attached to knobs, while between the bridge and the crossbar the strings seem to be without support, this arrangement of the strings being apparently best adapted for keeping them stretched taut on the lyre. And what is Amphion saying? Certainly he keeps his mind intent on the harp, and shows his teeth a little, just enough for a singer. No doubt he is singing a hymn to Earth because she, creator and mother of all things, is giving him his walls, which already are rising of their own accord. His hair is lovely and truthfully depicted, falling as it does in disorder on his forehead and mingling with the downy beard beside the ear, and showing a glint of gold; but it is lovelier still where it is held by the headband – the headband “wrought by the Graces, a most lovely ornament,” as the poets of the Secret Verses say – and quite in keeping with the lyre. My own opinion is that Hermes gave Amphion both these gifts, both the lyre and the headband, because he was overcome by love for him. And the chlamys he wears, perhaps that also came from Hermes; for its colour does not remain the same but changes and takes on all the hues of the rainbow. Amphion is seated on a low mound, beating time with his foot and smiting the strings with his right hand. His left hand is playing, too, with fingers extended straight,37 a conception which I should have thought only plastic art would venture. Well, how about the stones? They all run together toward the singing, they listen, and they become a wall. At one point the wall is finished, at another it is rising, at still another the foundation is just laid. The stones are eager in rivalry, and happy, and devoted slaves of music; and the wall has seven gates, as the strings of the lyre are seven"
3. 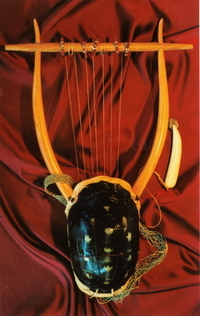 PROOF THAT THE ANCIENT GREEK CHELYS (TORTOISE SHELL) LYRE WAS ALSO SOMETIMES MADE FROM WOOD IN THE FORM OF THE TORTOISE SHELL? "All the wood required for the lyre is of boxwood, firm and free from knots – there is no ivory anywhere about the lyre, for men did not yet know wither the elephant or the use they were to make of its tusks. The tortoise-shell is black, but its portrayal is accurate and true to nature in that the surface is covered with irregular circles which touch each other and have yellow eyes"
"This is the subject of the painting...Look carefully at the lyre first, to see if it is painted faithfully"
In this context, the passage is describing a painting of a tortoise shell lyre - in this context, the later occurrence of the word "portrayal " in the passage could, in fact mean, the portrayal in a painting of the shell of the lyre! Indeed, following further research, the very publicly available information quoted in Wikipedia for the chelys lyre being "which had a convex back of tortoiseshell or of wood shaped like the shell" originates from an article from 1911 by Kathleen Schlesinger for Encyclopedia Britannica - but in the original article from 1911, no original sources to substantiate this claim are given - is this actually an 'urban myth' generated by this 107 year old 'authoritative' assertion, which in reality, has no actual hard evidence to back it up, whatsoever? Although the ancient Greeks would have known the superior acoustic qualities of wood over the poor resonance of an actual tortoise shell, I have, regrettably not been able to so far find any other unambiguous first-hand ancient illustration or account in an ancient text to definitively affirm or deny the intriguing possibility that the shell was indeed sometimes substituted for wood carved in the general form of the tortoise shell in order to add richness to the resulting tone. "Alas, what wickedness to swallow flesh into our own flesh, to fatten our greedy bodies by cramming in other bodies, to have one living creature fed by the death of another! In the midst of such wealth as earth, the best of mothers, provides, nothing forsooth satisfies you, but to behave like the Cyclopes, inflicting sorry wounds with cruel teeth! You cannot appease the hungry cravings of your wicked, gluttonous stomachs except by destroying some other life"
4. THE BUZZING TIMBRE OF THE ORIGINAL LYRES OF ANTIQUITY? I have argued in several of my other posts throughout this website, (including the sections I have researched regarding the Roman lyre known as the Cetra and the Ethiopian Begena), that it is likely that a subtle buzzing quality was quite common to the timbre of most of the lyres of antiquity - rather than having the sharp-edged, modern guitar-style bridge which creates a pure, harp-like tone, almost all the detailed depictions of the actual lyre bridges used in antiquity, tend to show a much wider, 'bench shaped' top of the bridge. The main consequence of this shape of bridge, is that due to the greater surface area on which the vibrating portion of the string rests, there will be a subtle, sitar-like buzzing quality to the tone as the vibration is transmitted through the bridge to the resonating body of the lyre. Indeed, this buzzing quality is the main feature of the Ethiopian Begena - the archaic 10-string bass lyre still played in Ethiopia today. "Phoebus, god of Delphi, Locrian Eunomus set up this cicada in your honour, an appropriate symbol of his victory. He was competing in the lyre contest against his rival Sparthys and the strings resounded as he plucked them with the plectrum. A worn string began to buzz with a hoarse rattle and spoil the true melody of the music. Then a sweet-voiced creature, a cicada, flew chirping onto the lyre to supply with its song the broken string. Recruited to follow the rules of musical sound, it flew down from the high glades to bring us aid with its chirping song. Accordingly, so that the honour due to your cicada, o holy god, may last undiminished, on top of the lyre she sits here herself, a minstrel in bronze." The buzz of the cicada matched the tone of the broken lyre string perfectly, so that Eunomus could finish his piece and win the Kithara contest! Why would the distinctively buzzing tone of the cicada be featured in this ancient Greek story, if this buzzing quality was not also in some way a unique feature of the actual timbre of the ancient Greek Kithara? The story would make little sense, if the timbre of the ancient Greek lyres were all pure, clear and more harp-like. If the Greeks had invented the computer and the scanner, we might have the Libraries of Alexandria, Athens, Tarsus, Pergamos, etc. to this day. Of course with our luck they'd be in file formats we couldn't read... ;) Two excellent finds, Michael.